A Mw 5.4 earthquake shook southern California on July 29, 2008, just before noon. 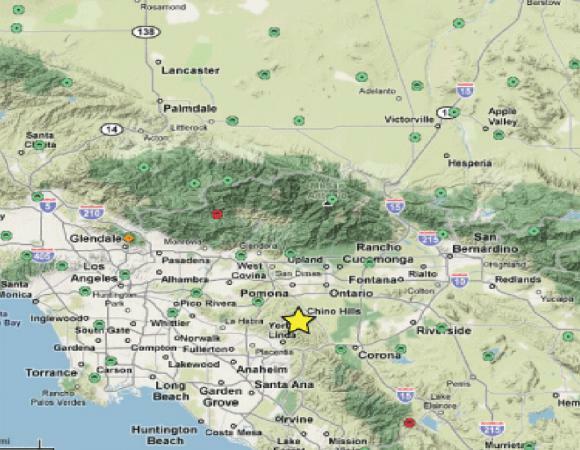 It was located 4 km southwest of Chino Hills, CA, 46 km ESE from Los Angeles, and occurred at a depth of 14.7 km. This location puts it within 50 km of over 40 PBO GPS monuments, as well as a cluster of seven borehole strainmeters about 90 km to the southeast. High rate data (sampled every second) is available from both the GPS monuments and borehole strainmeters on the PBO web page. Preliminary analysis suggests the Whittier fault may have ruptured in the earthquake, although the distribution of aftershocks and 59 degree dip of the fault plane differ from the 82 degree dip of the Whittier fault. Nearly 50 aftershocks have been recorded, the largest of which was a Mw 3.8.